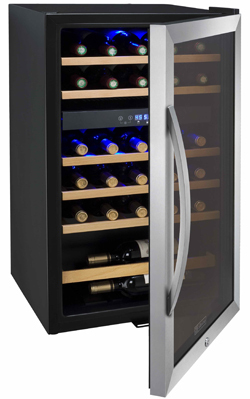 The Allavino Cascina Series CDWR29-2SWT Dual Zone Wine Refrigerator is a freestanding compact cellar that is capable of storing up to 29 wine bottles in optimal conditions. Its alluring design and ultramodern performance make for a winning combination that is sure to impress all of your guests! The CDWR29-2SWT boasts dual zones with removable wooden shelves that can hold up to 5 bottles each, and includes a storage area at the bottom for an additional 4 bottles. These sturdy hardwood shelves can easily be extended and removed, allowing you to easily load and unload bottles. The bottom storage area offers plenty of room for oversize bottles, providing a handy place for the larger bottles in your collection. An easy to see LED display and temperature controls make monitoring and adjusting the temperature quick and easy. Both temperature zones can be set as low as 40°F or as high as 65°F, ensuring that you'll find the perfect setting for your individual storage needs. With the push of a button, cool blue interior lighting illuminates the cabinet, beautifully displaying your collection and making it easy to find exactly what you're looking for. Showcase your collection with an elegant stainless steel framed glass door, with UV tinting to protect your wines from harmful light. A keyed security lock keeps your collection safe.